Douro Profundo was born from a new found passion for wine and the Douro region, with the hopes of creating a reliable and educational resource, while also shining a well-deserved spotlight on this long underestimated region. 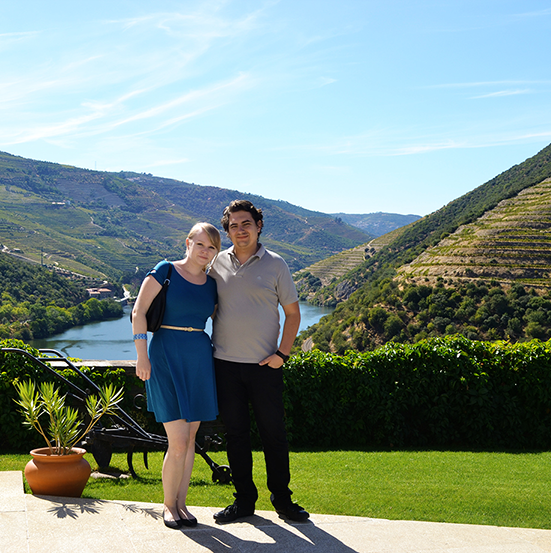 Our first visit to Port wine country was in the Summer of 2013, and we immediately developed a love and deep appreciation for the wine, the people, and the beautiful landscape of the Douro. We immediately began collecting information, learning more about the region’s history, Quintas, and Enotourism, but found very few resources available online. Since our first visit, we have been frequent visitors, and have continued working on what would become Douro Profundo. Our goal is to introduce everyone to: the region, which is currently experiencing an exciting revolution; the culture, the warm hospitality and pride of the people who are apart of the region’s wine production; and the wine, breaking the stereotype that this region produces Port wine exclusively. We are far from professionals: we are learning as we go, and hope to encourage others like us to indulge their curiosity. With the recent boom, commonly referred to as the “Douro Revolution”, interest in this historic region has been grown exponentially within the last year. For centuries, this region produced fortified wines (such as Port wine) almost exclusively. Recently, however, the number of estates producing non-fortified wines (Red, White and Rosé “table wines”) has increased drastically. These wines are catching the attention of the wine industry all over the world. Many Douro wines are now winning awards in various international competitions, putting this region on the map for more than just it’s Port wine. The Douro now exports a variety of wine: Fortified or Port wines, Moscatel, table wines as well as sparkling wine. The recent increase in media buzz surrounding the Douro has also encouraged a growth in tourism: there is an abundance of hotels, guest houses and spas, as well as activities beyond Enotourism. Coupled with it’s iconic landscape, it’s no surprise the Douro is becoming famous for more than just it’s wine. Whether you drive or take the train along the Douro river, the scenery alone is worth the trip. Wine can often be portrayed as an elite and intimidating subject, which is a stereotype that should not discourage anyone from enjoying it, or from visiting the region. Wine is not something that is reserved exclusively for connoisseurs or Sommeliers, it should be accessible to everyone. Having only recently discovered our own passion for wine, we enjoy sharing our experiences, and opinions based on our personal experience with each wine, in hopes of providing some details that might be of interest to our readers, so they can judge whether or not it would be a good fit for their own tastes. Currently based in Dublin, Ireland, we make a point of visiting the Douro as often as possible. We enjoy documenting and sharing our experiences with our readers, providing our readers with an authentic look at the character of the the region and it’s wine.